Christian Chenailâ€™s Muse celebrated its 20th anniversary with an easy 50s-inspired spring-summer collection in solid colours and a multitude of textures. This season, Muse flaunts what Chenail does bestâ€”an all-out party of curves, cinched waists, swingy skirts and tall piles of hair. Boatnecks and deep V-necklines made for exquisite cameo framing, as did the dÃ©colletage in wrap blouses and structured jackets. Clean, romanticized silhouettes set the stage for dizzying combinations of prints and texturesâ€”from polka dots and waffle knits to pin-stripes and floral prints in cotton, linen and silk. Thankfully, the veteran designer keeps the colours simple with black, crisp white, bright red and shades of blue. Though the short shorts and cropped tights seemed like sporty afterthoughts to the 50s theme, the long strapless floral-garden gown was perfectly in line and stole the Montreal Fashion Week show. The collection predominantly featured pretty dresses and separates, yet it was Chenailâ€™s immaculate tailoring that reminds us how this label maintains its appeal. 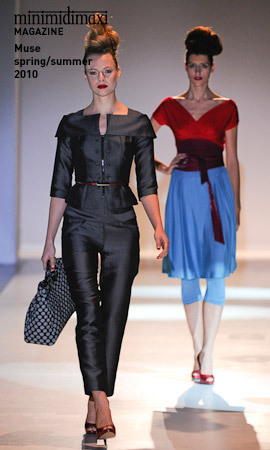 The shimmery blue pant suit with Fath-inspired decorative buttons and white skirt suit were statements in flattering fit. So great to see the seasonâ€™s trends interpreted in sharp cuts and with a subtle hand.